A house fire that broke out at Sixth and Bruce was determined to not be suspicious. Mar. 24, 2016 9:00 a.m. Port Alberni fire crews were called to a house fire at Bruce Street and Sixth Avenue at 11:20 p.m. last night (March 23). Port Alberni fire crews responded to a house fire at Sixth Avenue and Bruce Street at 11:20 p.m. last night (March 23). One man and his pets were in the home but no one was injured. The blaze in the single family dwelling was called in by the owner’s security company following an alarm activation. 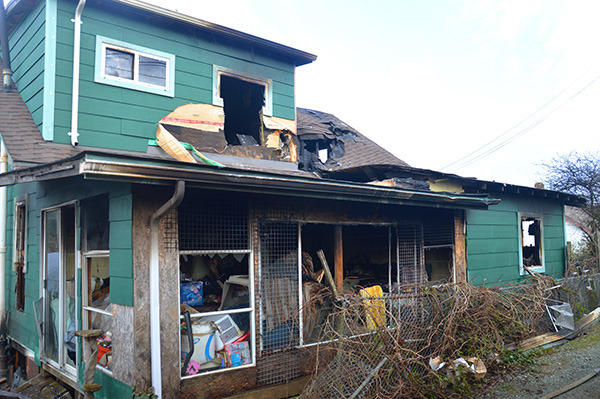 “A gentleman was home in the evening with a dog and a cat and was upstairs when he got a call from his security company that monitors smoke alarms in the house,” said Port Alberni Fire Department chief safety officer Randy Thoen. The fire has been deemed non-suspicious. When fire crews arrived, smoke was pouring from the house. “They found smoke issuing from the basement area of the house. They had some difficulties with entry,” said Thoen. Thoen said that fire crews stayed on scene thoughout the night and will be there today to deal with hot spots. A truck each from Beaver Creek and Sproat Lake were also called out to help with the sustained blaze.